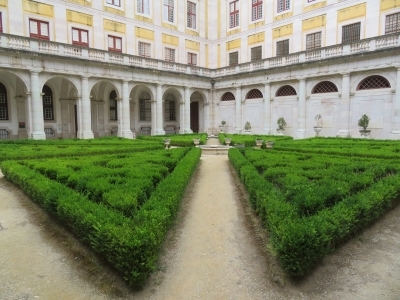 Royal Building of Mafra – Palace, Basilica, Convent, Cerco Garden and Hunting Park (Tapada) is part of the Tentative list of Portugal in order to qualify for inclusion in the World Heritage List. Mafra Palace is pleasant enough, but like other visitors I wonder where is the OUV? Sure, it seems like most of us did not opt to visit Cerco Garden and the Hunting Park (Tapada). Perhaps these components are rewarding and differentiate the site from other royal palaces. Nevertheless, time is also somewhat important to me and it would have been hard to justify the extra time considering our already fairly busy drive to Coimbra. The basilica was a highlight in part because of the atmosphere. I entered as it opened, no lights. The vast space was very dark, silent, and therefore a bit different than previous experiences in large religious buildings. The library is certainly impressive and we had a nice chat with some enthusiastic and well-versed employees about the collection. It is possible to reserve time in the library to do research, from our understanding this includes anyone. This might be worthwhile for anyone with linguistic skills. 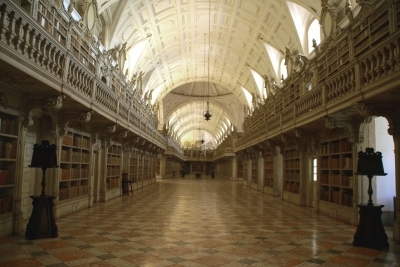 The collection houses books in Portuguese, Latin, Spanish, Arabic, and English to name just a few. While roaming the vast halls, I kept thinking that a bike would have come in handy. Yes, completely ridiculous, but the hallways do seem to go on forever and most rooms are fairly bland. The Palacio Nacional de Mafra is nominated for inscription in 2019, reason enough to include Mafra in my itinerary for my Portugal Trip in May 2018. The palace is huge, the front is 220 meters long, it seems completely oversized for the small town. The Palace-Convent complex was built in the 18th century and was paid with the gold from the colony of Brazil. When visiting the palace, you have to walk through an endless number of rather uninteresting rooms, worth mentioning are only the hospital and the library (photo). The library is certainly impressive, but you can not properly visit, only the first meters are accessible. The nomination also includes the Cerco Garden behind the palace, not outstanding, and the hunting grounds, the Tapada Nacional de Mafra. There are several marked trails and even guided tours that start from an information centre about 8 km northwest of the palace. However, I did not visit the Tapada, I thought I had enough hiking the days before at Sintra. Mafra is certainly of national importance, it is considered the most important baroque building in Portugal, but not enough to justify a WHS in my opinion. What I will remember from Mafra is mainly the long indoor hike. Mafra is a huge baroque palace complex North of Lisbon. When I arrived the sheer size of the site was impressive. Situated on a hill overlooking the coast, this is a clear statement of absolutism and the wealth generated in the Brazilian colony. However, when you move in or around the palace it feels like being built for size and show, not quality. The backside of the palace is pretty mundane as is the attached park. And in the interior the hallways are vast, but there is an emptiness to it. Some of it may be due to the French invasion and the best art pieces being moved to Brazil. But the prime inhabitants, the royals, also seem to have felt the same way as they didn't move in permanently either. Another run of the mill Baroque palace/monastery, what more is there to say? I have seen plenty of these (and better ones at that). 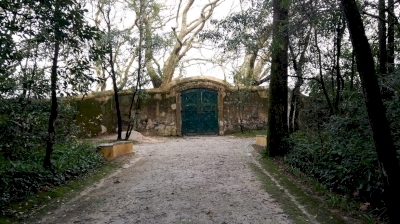 Compared to nearby Sintra it lacks the special Portuguese touch, Sintra's rich history and Sintra's great park. Consequently, I don't feel this merits inscription. A bus runs more or less hourly from Lisbon to Mafra. Check the schedules.